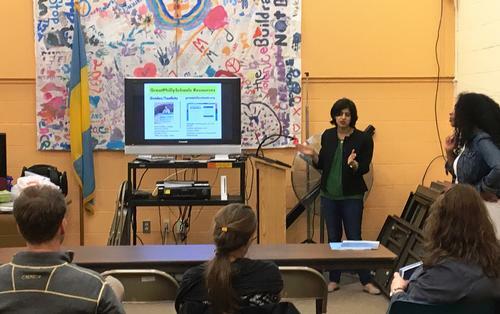 In October, several of our neighborhood libraries hosted School Registration Workshops for parents with students entering either Kindergarten or High School. These workshops were provided to the library system by Great Philly Schools. We believe every child in Philadelphia should have access to a great school. Our mission is to make information accessible so parents, guardians, and students can find, compare and demand great schools. To this end, Great Philly Schools provides a number of resources including their website, high school and K-8 print guides, school fairs, text and email alerts, and the previously mentioned workshops. Last month Whitman Library hosted a kindergarten workshop and Fumo Family Library offered a high school workshop. Scheduled next is another kindergarten workshop at Falls of Schuylkill Library on December 6 at 7:00 p.m. If you have a child preparing to enter kindergarten, please consider attending this event, and for parents of children either preparing to enter kindergarten or high school, please continue to check Great Philly Schools’ event listings for upcoming workshops.